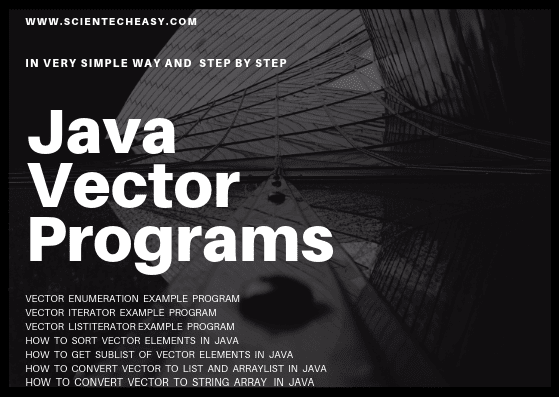 In this tutorial, we will learn various example of Vector Programs in Java using Enumeration, Iterator, and ListIterator. We will also learn some important programs related to methods of the vector class. So, let's see example programs. In this example program, we will iterate elements of the vector using Enumeration. We will also add or remove an element during the iteration. It will not throw ConcurrentModificatioException. We will explain all the steps in the program. In this example, We will iterate elements of the vector in forwarding direction using Iterator. When we add or remove an element during the iteration, it will throw ConcurrentModificationException. Let's see a simple program. Using ListIterator, we can iterate a vector in both forward as well as backward direction. You follow all the above steps. You already know that vector maintains the insertion order that means it displays the same order in which they got added the elements to the vector but you can also sort the vector elements in the ascending order using Collections.sort() method. Let's see a simple example program to sort the vector elements. We can get a sublist of vector elements using subList() method of vector class. This method will return a range of elements from the list between fromIndex, inclusive, and toIndex, exclusive. We can convert a Vector into the List using Collections.list(vector.elements()) method. This method will return a list of elements. Let's see a simple example to understand the concept. public String toString(); // It returns a string representation of each element of a Vector. We hope that this article will help you to learn and practice example programs of the vector in Java. All programs are basic but important to make the command and clear the concepts of the vector in Java.